Hi, I am interested in your 2019 Palomino Puma (stock #78181) listed on Autotrader for $27,613. I'd like to get more information about this vehicle and confirm its availability. 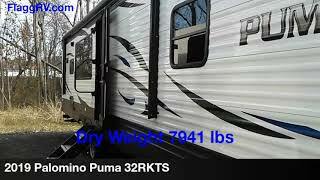 This Puma 32RKTS travel trailer is perfect for a couple or family of 4 that doesnt want to spend all their time setting up at the campsite, or cleaning up after a fun weekend. The parents or grandparents will enjoy their own private bedroom with the option to add a washer and dryer, while the kids get to laugh and talk in the main living and kitchen area after the booth dinette and sofa in the slide out is prepared for nighttime. Having a full bathroom including a shower with seat is a must if you dont enjoy using the public facilities while away from home. There is storage throughout the inside as well as outside in the pass-through compartment. You can bring along all of your favorite camping goodies and easily store them inside the walk-in pantry, and the LED lighting throughout will help guide you whether day or night!